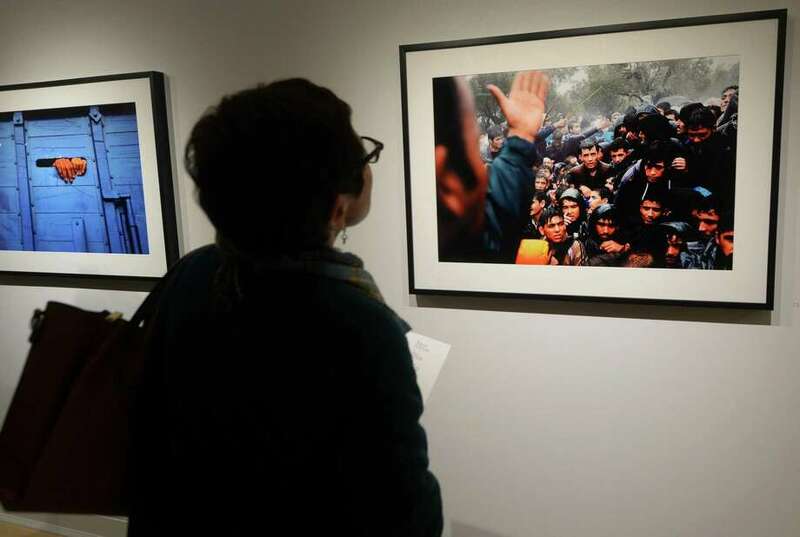 Westport resident Roseanne Spengler looks at the exhibit by and Westport native Getty photojournalist Spencer Platt, Fractured, Friday, January 11, 2019, at the Westport Arts Center in Westport, Conn. The show runs through March 3rd. The Jewish refugee survivors of the SS St. Louis will participate in a program to commemorate the 74th anniversary of the liberation of Auschwitz and the 80th anniversary of the SS St. Louis, at the Chabad of Wesport on Jan. 24 at 7:30 p.m. The program will include the screening of the award-winning documentary film “Complicit” and will feature St. Louis surviving passengers Judith Steel, Sonja Geismar and Eva Wiener, who will participate in the post film question-and-answer session led by the film’s creator andproducer Robert M. Krakow. After having been denied entry by Cuba, the ship carrying over 900 Jewish refugees escaping Nazi terror were denied safe haven by Secretary of State Cordell Hull. They pleaded to the government of Canada and again refused political asylum. Cost is $25 for adults, $18 for students. Westport Arts Center, in partnership with Westport Arts Advisory Committee, has launched Tete-a-Tete, a new project that combines exhibition, competition and placemaking. Call for entries is open through Jan. 25 at westportartscenter.org/cfe. The exhibition will be on view March 8-16, with an opening reception March 8, from 6 to 8 p.m. at Westport Arts Center. Jurists for the project are John Edelman, CEO of Design Within Reach; Patricia Kane, curator of American Decorative Arts at the Yale University Art Gallery; and Paul Goldberger, a Pulitzer Prize-winning American architecture critic and educator. The exhibition will feature artists that reimagine and reinvent the Victorian-era conversation bench — also known as a tete-a-tete, courting bench, conversation bench, kissing bench and gossip’s chair. This unique piece of French furniture emerged in the 19th century, and translates to head-to-head-describing the early functionality of these seats during the Victorian era. The project is envisioned as a symbolic way to encourage conversation and civility within the community. The exhibition aims to foster dialogue in these polarized times-as people sit, talk and listen, their understanding and tolerance of each other will organically improve. Awards will be given in fantastical, functional and collaborative design categories. Artists, furniture designers, architects, industrial designers, and creative thinkers are encouraged to participate and to collaborate with others. Ultimately, the winning bench design may be fabricated and find a home along the Saugatuck River, be an installation piece that travels around town, or become part of Westport’s Permanent Art Collection. The Norwalk Seaport Association will host “Ring in the New Year” at the Unitarian Church in Westport as part of its effort to raise funds for Sheffield Island Lighthouse preservation. The event will take place Jan. 19 from 7 to 9 p.m., and includes champagne, beer, wine and appetizers provided by Simply Delicious caterers of Norwalk. Tickets for this tax-deductible event are $100 each and available online at www.Seaport.org or by calling 203-838-9444. St. Thomas Aquinas Catholic School will expand its pre-kindergarten program for the 2019-20 school year, the school announced in a news release. The new program will include children who turn 3 years old on or by Aug. 31. Principal Jo Ann Mathieson said the development of a two-year pre-school program was by popular demand. “The emphasis of a two-year preschool is to build on, expand the child’s experiences, and ultimately prepare for kindergarten. We are making this change to best accommodate the needs of families working or living in Fairfield, Westport and the surrounding area. The expanded program hours mirror the hours of our regular school day. All pre-K children will also have the additional option to arrive as early as 7:30 a.m. and stay until 5:30 p.m.. Flexible schedules and shorter options are also available,” she said. St. Thomas will hold a schoolwide open house on Jan. 27 between 10 a.m. and noon. Families living or working in Fairfield, Westport and surrounding towns are encouraged to stop by, take a tour, and speak to the administration, faculty and other parents. The school is located in the heart of downtown Fairfield at 1719 Post Road.